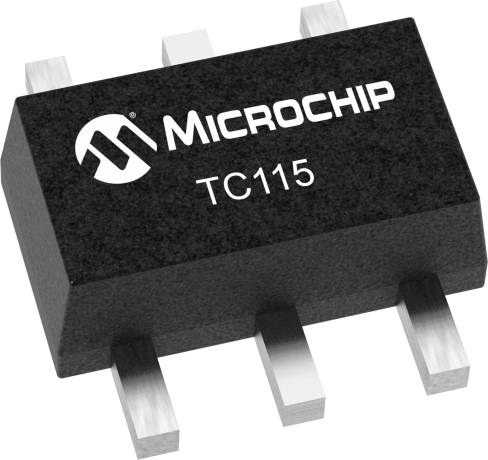 The TC115 is a high-efficiency step-up DC/DC converter for small, low input voltage or battery powered sys-tems. This device has a guaranteed start-up voltage of 0.9V and a typical supply current of 80 µA. Phase compensation and soft-start circuitry are included on-chip. Unlike conventional PWM step-up converters, the TC115 automatically shifts to pulse frequency modulation (PFM) at low loads, resulting in reduced supply current and improved efficiency. The TC115 requires only an external diode, an inductor, and a capacitor, and supports typical output currents of 140 mA. Supply current is reduced to less than 0.5 µA, max when SHDN input is brought low. Small size, low installed cost, and low supply current make the TC115 step-up converter ideal for use in a wide range of battery powered systems.